10W LED Recessed spotlight Complete Kit. 1.Contemporary style light with integral swive,Adjustable lighting direction , point the light to the location you want. 2.Design with integrated LED chips, no additional bulbs needed. Quality housing provide excellent heat dissipation, prevent device from overheating. 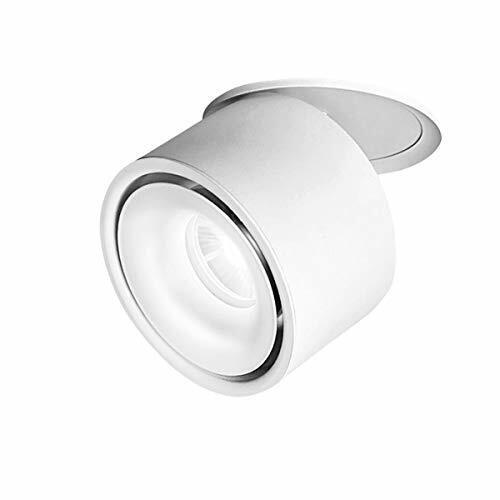 3.Easily mounts to ceilings ,ceiling cutout: 90mm（Diameter）. 4.Examples of applications: corridors, warehouses, restaurants, conference rooms, salons, exhibition space, shops, bars, restaurants, hotels and other lighting. ✔ Light color: cool white（6000K）, 10W,Product Size: 100 * 80mm , Cutout: 90mm,Material: Aluminum.Voltage: 85V-265V. ✔ Can be folded 90 degrees, 360 degrees rotation.so you can direct the light where needed and adjust it to your preference,meet your lighting needs. ✔ The COB LED ceiling spotlight has a strong and focused beam,adjustable lighting direction,Can be installed on the ceiling . ✔ Sturdy die casting aluminum alloy housing, produce less heat,More durable.LED driver with short circuit protection design. ✔ Wide range of application:Such as cabinet,bookshelf,showcase, shop display,hotels, restaurants,home,other indoor picture,wall artwork display lighting.